The EVERLAM™ Polyvinyl Butyral (PVB) film is now widely recognized as the preferred material for making the laminated glass that makes modern buildings safe, more attractive and more comfortable to live in, as well as respectful of the environment. No doubt today’s commercial and industrial buildings appear a lot more appealing than they did a decade ago. Laminated glass makes the difference. It is visually pleasant, allowing maximum day light. It is comfortable, controlling noise, heat and ultra-violet (UV) penetration into the building. It is also safe, creating a light yet tough barrier that stops people falling through the glazing in case of an accident. Laminated safety glass using EVERLAM™ PVB interlayer allows architects and designers to be fully flexible in their designs while meeting all other requirements of safety, noise, heat and UV control. It keeps building facades together with no risk of exploded glass injuring pedestrians or halting traffic. It provides superior glass edge stability and resistance to delamination. It prevents people injuries due to broken glass. EN410: light and solar heat transmittance/reflectance. EN12600: impact safety film for glass. 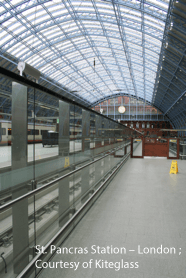 ASTM C 1172 – Standard Specification for Laminated Architectural Flat Glass. required to resist a specific load. ASTM F1233 – Standard test method for security glazing materials and systems. 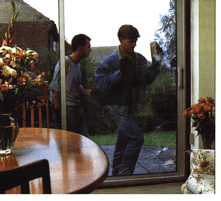 UL 972: Burglar Resistant Glazing. ANSI Z97.1 - American National Standard for Safety Glazing Materials Used in Buildings. For a long time balustrades were made with tempered glass, but now laminated tempered glass has taken over as a preferred material, simply because it is much safer and much better at preventing people from falling through in case of an accident. Laminated safety glass using EVERLAM™ PVB interlayer makes strong yet esthetic balustrades. BS6180: barriers in and around buildings. EN 1991: actions on structures. EN 2608: reliable glass constructions. Modern designs feature overhead protections in glass. Laminated glass for overhead glazing offers many advantages: its stays in place when the glass is broken and allows replacement at the building owner’s convenience. With annealed or strengthened glass, broken glass would cause a glass shower and be a real threat to people as well as leave the space below open to the prevailing weather. EVERLAM™ PVB interlayer for laminated safety glass conforms to the DiBt (Deutsches Institut für Bau technik) regulations of tensile strength and elongation specified for such application. DibT norm on PVB interlayers. 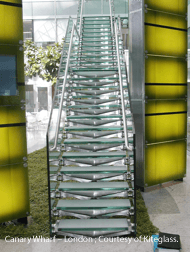 Glass floors and staircases are often a key feature of contemporary houses buildings. 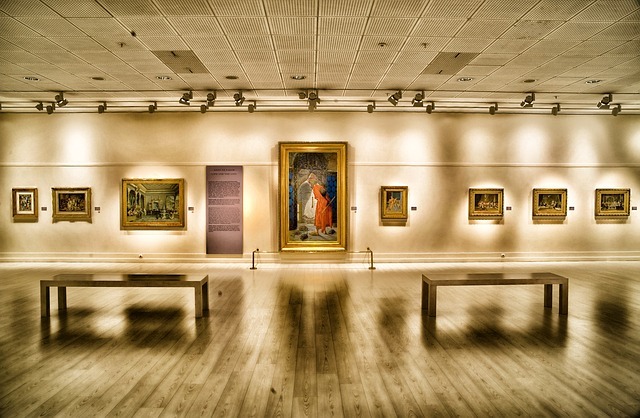 They also offer a stylish touch of modernity in renovated traditional buildings. Transparent, they provide a sense of lightness in a building and an unusual perspective on its structure and space. ASTM E1300 – Standard Practice for determining the minimum thickness and type of glass required to resist a specific load. Clear or colored glass panels are very popular decorative indoor and outdoor elements. You see them in shops and public places as well as in offices. Laminated safety glass using EVERLAM™ PVB interlayer allows colorful designs without compromising on safety or security. Available in a range of colors for interior and exterior applications, its fundamental technical characteristics of safety and security as well as noise, heat and UV protection are preserved. The main reason for using laminated glazing in homes is to protect the house and its inhabitants against forced entry into the house and burglary. Of course laminated glass is also used in home facades, balustrades, overhead glazing, floors and stairs, interior glazing and, more rarely, to resist possible blasts and bullets. In order to ensure protection, the entire glazing system, and not just the glass panel, needs to be conceived to withstand a series of impacts from weapons such as a hammer or a crowbar. Laminated safety glass using EVERLAM™ PVB interlayer provides a range of protection levels. It will help delay a burglar’s entry while security forces arrive or deceive a potential burglar. EN356: glass in building, security glazing, testing and classification of resistance against manual attack. ASTM C 1172: Standard Specification for Laminated Architectural Flat Glass. Everyone is at risk of burglary and protecting property is everyone’s concern. The security properties of laminated safety glass using EVERLAM™ PVB interlayer has been proven for a long time. Different configurations, composed of glass with various treatments and varying number of interlayers and thickness, produce different levels of burglar resistance. 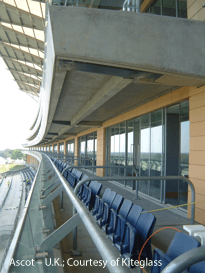 EVERLAM™ PVB interlayer comes in a range of thicknesses that provides high protection. EN 1627: Windows, doors, shutters – Burglar Resistance – Requirements and classification. EN 1630: Windows, doors, shutters – Burglar Resistance – Test method for the determination of resistance to manual burglary attempts. Increasing risk of man-made disasters besides natural ones has triggered the feeling that protection against blast loads and explosion is necessary. Studies indicate that in a blast accident the majority of victims and damages are caused by shattered flying glass hitting people. 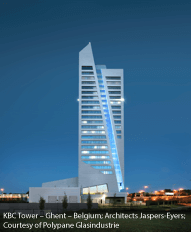 The appropriate composition of laminated glazing using EVERLAM™ PVB interlayer helps withstand the initial shock wave and subsequent retracting pressure wave by maintaining the glass in place and protecting buildings and their occupants. It represents a serious reduction in the cost associated with facility damages. We use Finite Element Modeling software to help define the best design criteria. EN13541: testing and classification of resistance to explosion pressure. EN13123-1: Windows, doors, shutters – Explosion resistance – Requirements and classification – Part 1 – Shock tube. EN13124-1: Windows, doors, shutters – Explosion resistance – Test method – Part 1 – Shock tube. Certain activities, such as banks, currency exchange booths, jewelry shops, toll booths and other locations that involve transaction of valuables, are exposed to the risk of fire arm attack. For these, bullet resistant laminated glass provides a high degree of safety and security. A barrier to bullet penetration, it helps protect people from bullets as well as from glass fragments (“spall”) removed from the protective glass. Laminated safety glass using EVERLAM™ PVB interlayer is a strong material. With a minimum of 3 glass layers and 2 Everlam™ PVB interlayers up to a multilayer construction of 80 mm total thickness it can protect people from a large series of fire arms. EN1063: glass in building, security glazing, bullet-resistant glazing, classification and test method. UL 752: Bullet Resistant Equipment. 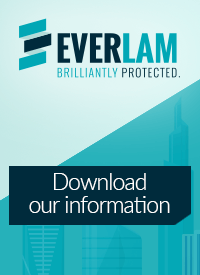 Want to learn more about EVERLAM applications?